Like good Local Pubs, it seems that good Local Yarn Shops are on the decline. Of course, online shopping has become the norm for everyone and their cousins and that’s understandable, because finding a Good Local Yarn Shop has become increasingly difficult. Why? Because we shop online. Probably because a lot of Local Yarn Shops choose to sell mostly acrylic Yarn (or Craft Yarn) – which is great fun for making pom-poms, toys, accessories, head trophies, socks or Christmas decorations as they are cheaper, machine washable, soft and often come in all sorts of electric colours, faux-fur, glitters, etc… – but it doesn’t feel or look as gorgeous as wool, in terms of knitting garments with it and doesn’t have the same durability and the same properties, in terms of warmth and breathability. Don’t get me wrong, I don’t always say non! to rayon. I do sometimes use mixed fibre yarn, especially as I do repurpose second hand yarn found at car boot sales, eBay or from the Vintage Stash my mum gave me. BUT, I do think that there is something truly magical and very special (and sustainable too…) about pure locally grown wool. I have recently asked the Local Yarn Store in my town why they mostly sell synthetic or mixed fibre wool (which is often a ratio of 70-80% acrylic and 20% wool). Although they do have different qualities of acrylic yarn, from the cheapest to the very fancy faux fur type, they only sell 1 type of pure wool yarn, and that’s in DK in only a couple of colours. “Why do you prefer synthetic yarn?” I asked. If we want yarn stores to sell locally grown, pure wool yarn, perhaps we only have to let them know, I wonder? I feel that Good Local Yarn Stores need a good shout out, because often people don’t even know they are there and ‘click’ instead of visiting an actual shop. Good Local Yarn Stores are not necessarily more expensive than online stores, and sometimes it’s nice to walk through the front door and have a real social interaction with other human beings who share a common interest with you. To be able to really feel the yarn in your hands before you buy it, to simply have a social and sensory experience in real life – to me knitting is all about the excitement of feeling the yarn in my hands and nothing beats the sensation of pure wool. Knitting can be a rather lonely activity and one is in danger of becoming severely socially inept! It’s like plugging into an area’s local knitting community. You get to meet other knitters who happen to be in the shop at the same time as you, and the shop keeper can give you a lot of advice if you’re stuck with a project (it’s a bit more interactive than watching a tutorial on youtube). They may even have Knit Nights in the shop or at least they should be able to tell you where there is one nearby. So today I’m taking you on a yarn trail across Sussex, to check out my favourite Local Yarn Stores in my neck of the woods. It’s a tour of stores that I have personally visited (regularly or not) and bought things from. Threadneedles, is located at number 16 on the Hight Street of East Grinstead (if you use a sat nav, the post code is RH19 3AW) with easy parking at the front. It’s right next to a very good bookshop, which has a great collection of knitting books. Threadneedles is a real Treasure Chest. “Threadneedles is a specialist needlecraft and haberdashery shop situated in historic East Grinstead High Street in an 18th century building. Carole and Steve Weighill opened it in April 2002 with the intention of providing a shop that sells a wide range of sewing and knitting goods from basic sewing and knitting supplies to embroidery needs to odds and ends such as feathers, pipe cleaners and pom-poms. The most important aim of the Business is to provide a friendly, knowledgeable and helpful service to all of their customers. 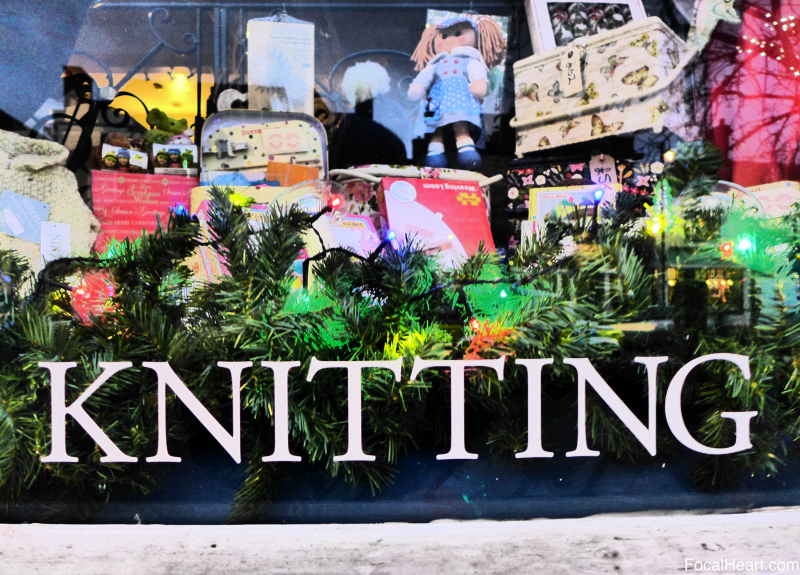 You can indeed find all your basic tools for knitting, crochet, and sewing, as the shop is also a well stocked up haberdashery and craft resources. Yarn wise they do sell a few shades of 100% pure wool British Yarn from Yorkshire in DK, but they mainly stock acrylic and acrylic/wool mix, such as acrylic/alpaca in chunky. They also sell sock yarn (Wendy Roam), and super wash yarns. They do make the effort to stock interesting acrylic yarn though, such as different colours of faux fur yarn, glitter yarn, and mixed fibre yarn with different ratio acrylic/wool. They know their stuff and you can tell they are trying to please a wide range of knitters. They also sell little gifts, toys, postcards and trinkets. The shop keepers will give you advice for free if you have bought the yarn for your project from the shop, otherwise they may ask you to make a donation to their St Catherine Hospice Donation Box. The shop ladies kindly took the time to help me when I was stuck once or twice. One of them runs a weekly knitting group just outside of town on Thursday mornings. There is another group called Knitter Natter which meets at East Grinstead library, the first Saturday afternoon of every month. While you are in East Grinstead I highly recommend that you take the time to scout the Charity Shops on London Road (which is right next to the High Street) as there are a lot of them. The Charity shop for St Catherine’s Hospice seems to have an endless supply of acrylic yarn in all sorts of electric colours and the shop for Cancer Research has a bucket full of second-hand straight (more or less…) knitting needles of all sizes hidden behind their counter that they sell for pennies. Further South, you have the lovely shop The Village Crafts (if you have a sat nav, the post code is RH18 5ES ), right in the middle of Forest Row, you can’t miss it. This shop sells art and craft supplies: drawing and sculpture materials, along with colourful wool tops for felting and Yarn. 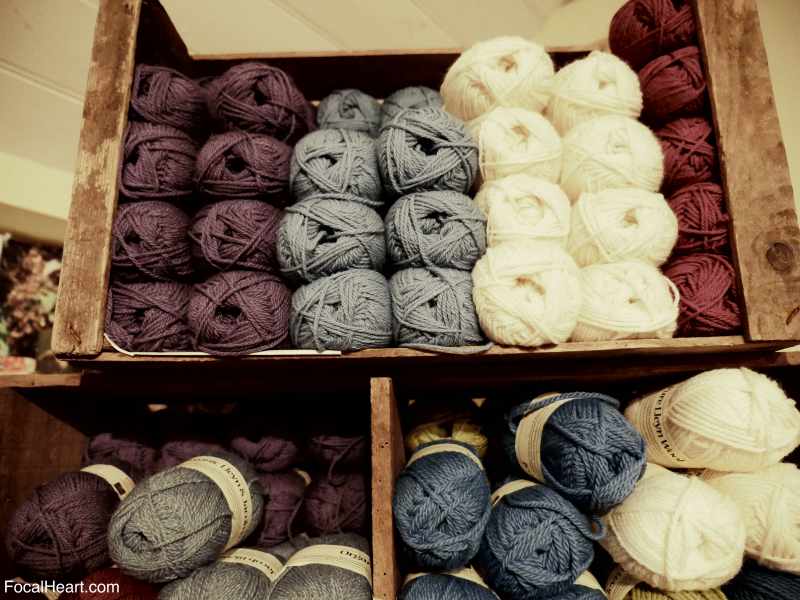 Their Yarn selection isn’t huge but you may find ethical yarn such as Manos Del Uruguay. They mostly sell Bergere de France, a few basics like huge balls of Aran yarn, cotton to knit dish clothes, Rowan wool and bags of standard merino. It’s a lovely little shop, with a very warm feel about it. It’s worth a visit. It’s easy to park outside if you are driving through on your way to or from London. Their stock may vary depending on the time of year. While you are in Forest Row, you may visit the pub next door or opt for a home-made gelato at Java & Jazz. Take the time to have a wonder in the village. You will need to drive from the village: go onto Priory Road at the main roundabout and just keep going through the woods and you will eventually see the farm on your right! It’s a biodynamic dairy farm and they sell raw dairy products. They grow their own biodynamic vegetables – I don’t know if it’s the magic biodynamic herbal potions that they enrich their soil with, that they garden with the cycles of the moon or the fact that the whole farm is run on spring water, but they grow the best veg I have ever eaten! This photograph shows the farm’s beautiful home grown seasonal vegetables and their yarn, in bags above the veg and in the left corner… (Picture Plawhatch farm). They also sell beautiful yarn, made from the fleece of their own herd of Lleyn sheep. They get their raw fleece sent to The Natural Fibre Company in Cornwall, where it’s washed, combed, spun and dyed organically. They don’t have so many colours to choose from this year – As you can see below, they currently have dark red, light (slate) blue, white and purple. Some is spun in worsted and some in DK. This year they have ordered less colours than last year, because they are running workshops on wild harvesting plants for dyeing wool and they are planning to grow hedges especially for this purpose, so they got a lot of white yarn in. And they have ordered a few cones of much thinner wool for carpet making. I previously wrote and raved about their yarn, most recently here. While you are there, have a wonder around the farm at the back of the shop, as it’s a very picturesque place, and take the time to meet the animals (see photos above). They will deeply appreciate the attention. There is a tap on the car park outside the shop, with spring water coming out of it so it’s a good spot to top up on water before you carry on. Out of the farm turn left and then the next right and you will drive through Ashdown Forest some more (yes THE forest of Winnie The Pooh. It was written here, in Hartfield!) and you will get to Wych Cross. Go straight through the crossroads, past the car dealer and the garden centre and keep driving through the Forest. You will have the Ashdown Forest Centre on your left (– Post Code for Sat Nav: RH18 5JP ). They do provide a lot of information there, but most importantly they sell beautiful local yarn grown on the sheep who roam on the Forest all year round. The sheep play a key role in the management of the forest, so they graze freely on different parts to keep the heathland from being overrun by other species. They have herds of the primitive Hebridean Sheep breed, so the yarn they sell is undyed, in natural stunning (very) dark brown. If you keep on driving, why not stop on one of the car parks on the left to admire the stunning view of the forest and go for a walk in the Valley? If you are planning on going for a walk with your dog(s) check with the Forest Centre where the sheep are currently roaming in the forest first, because they move them around and you may just bump into them around a bend. If your dog(s) are like mine, well… you want to be prepared. Back on with our road trip: Turn around, go back to Wych Cross and turn left at the red light/garden Centre. Drive for a few hundred metres and you will see the Llama Park on your left. The park has Llamas, alpacas and reindeer roaming free in fields. Their shop sell alpaca knitwear and their own alpaca yarn. Father Christmas goes there with his reindeer every weekend leading up to Christmas. If you are on your way to Brighton, you will need to go back on the A275 (turn left and then take the first right, yes it’s a sharp turn), and drive through Ashdown Forest some more. When you arrive in North Chailey, you may want to go through Chailey Commons Nature Reserve (turn left just before the petrol station in the direction of Lewes but take the first right) and head to Townings Farm ( – Postcode: BN8 4EJ ). Townings Farm sell the wool of their own sheep, another flock of Hebridean sheep and South Downs – a breed which originates from the native sheep that have roamed the Sussex South Downs for many hundreds of years. On your way to Brighton, you will get to drive along the edge of the town of Lewes. A little further down the road and you are in Brighton. You want to park near the North Laines, because that’s where you are going. The staff there are very knowledgeable, and they do have ‘Knit Nights’ and workshops there, with guest knitwear designers. I took this picture of the Seven Sisters a few years ago. It’s a beautiful place, with an estuary. It’s a great place for bird watching. 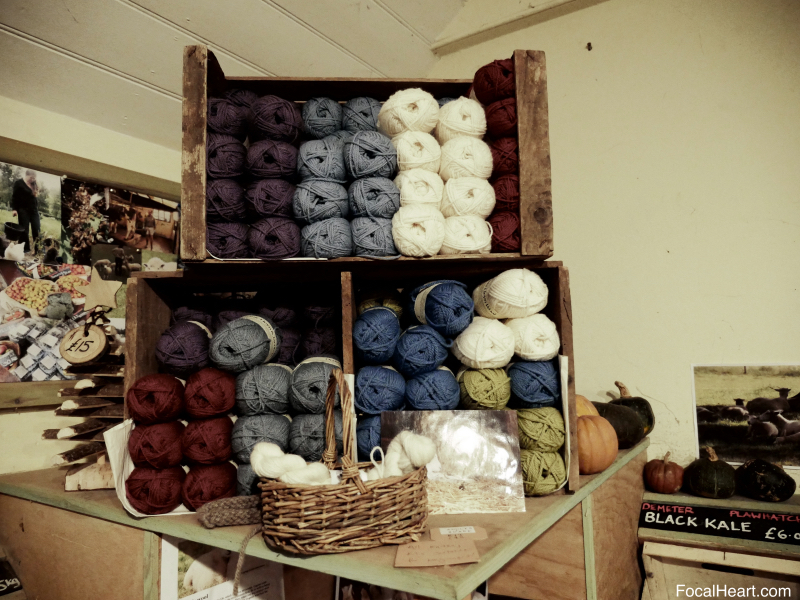 If like me you are very eager to meet and connect with the sheep who grow the wool you knit with, and if like me you have a local wool fétiche, if you love buying yarn made out of wool grown on places you enjoyed exploring, I think you will love South Downs Yarn. A yarn made with the wool of the sheep who roam freely on the South Downs of Sussex. Get on their newsletter now to be kept up to date when new batches are made! This is only my humble selection amongst the places near where I live. What about you? What is your favourite Local Yarn Store(s) in your area? I’d love to hear all about it! Feel free to add your own in the comments below! :) Is there no yarn store where you are?? Nice! I do like a nosey around an unfamiliar yarn store, even if it is through someone else’s eyes! I’m lucky to have a great place just on my doorstep… My friend Rosemary owns a gorgeous shop called The Constant Knitter, which has a great range of local and international brands. I get pretty much all my yarn from her, and she runs classes in the space above the shop too. Definitely worth a look if you’re ever in Dublin! That sounds fantastically brilliantly amazing! Does she have a website?? Yes, I probably should have included that! It’s http://www.theconstantknitter.ie, and the good news is that you can order online too!